The original image was part of a magazine scan found here at MT. I thought it had a very nice feel to it, and extracted Saber so I could add some effects to the other characters in the background. for starters i think u used too much rendering the into a canvas texture, it is somewhat distorted and certain blurring angels around her hands is kind of weird looking. overall good effort, but it is not exactly right in its ways. the background is kinda boring because you render them into a monotone color, however, i like the concept, makes it look a still motion screen capture. Hey they're playing. Nice one..
Hey, look at the ball, Freulein Saber! You'll lose it! 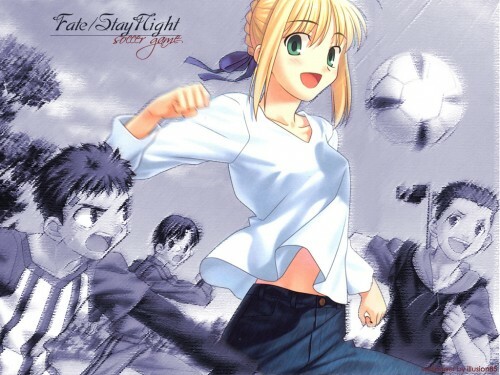 Saber plauing soccer? Strange idea, but nice draw.